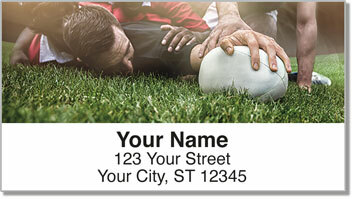 Rugby is a little like American football and soccer, but you probably won't see these guys wearing a helmet and a ton of pads! There's an interesting legend surrounding the beginning of the game. While playing soccer way back in 1823, a student at Rugby School in the U.K. picked up the ball and started running with it! It's the cardinal sin of soccer, but the mistake just may have launched a new sport! 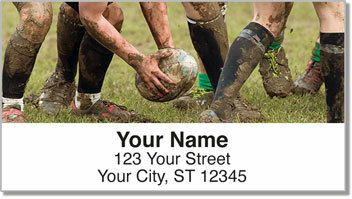 Rugby Address Labels are for athletes who love this hard-hitting team activity! 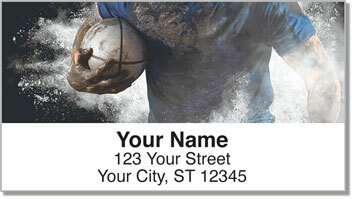 But while the game is tough, preparing your mail won't be - thanks to these self-adhesive labels. Just stick them right on all your letters and packages! 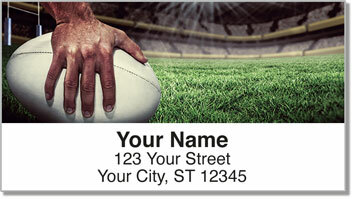 Order your very own Rugby Address Labels today! Get them with a set of matching personal checks!